The other day I was talking to a friend whose daughter and my son are classmates. They have been studying together since they both have started going to school. So, it’s quite familial. The friend and I got talking, and as expected school and its functioning becomes a topic of discussion. And, slowly we move to the Creative Writing class that I take for kids. My friend tells me that how important it is to have a good teacher, or else the child at times loses interest in something that he once loved. I agree wholeheartedly. There is nothing that can take away the importance of a good teacher. She asks if she can send her son for classes with me. And I say that there is still time. And we can wait more. 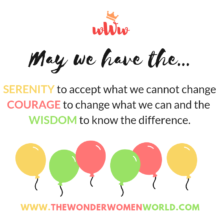 My friend then tells me that few months back as her daughter did some dance postures wrong, the teacher rebuked her so badly that the little girl (her daughter) ended up crying and howling. She felt so insulted and humiliated that forget about going to the same teacher again, she refused to dance again. She just gave up something she loved so dearly. The girl is all of 11 now. I hear her feeling pained. But, I also know that little tender hearts are not strong enough to take humiliation. They break easily. And, it has happened here too. A dream has broken. A heart has broken. Perhaps, permanently. 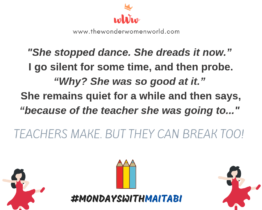 MONDAYS WITH MAITABI:AND DIWALI IS HERE! What a sad heart wrenching experience for the young child. I feel harsh, hard hearted people who can’t understand young minds should not become teachers.